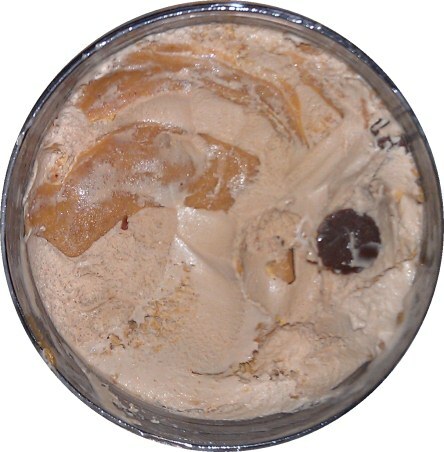 [New for 2012] When annoucing their limited edition holiday Eggnog flavor, Talenti mentioned their newest flavor, Chocolate Peanut Butter Cup, would slowly be rolling out and should hit all of us by Spring 2012. Well, lucky for me, I went out to find something for National Chocolate Day and found my kind of chocolate treat. I can't tell you how excited I was to see this. 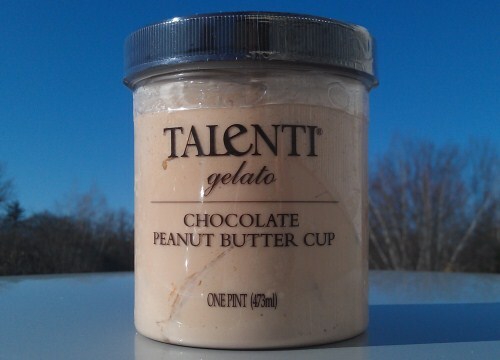 Talenti always does things a little different and I can't wait to see how they bring their top notch skills to the combo of combos: Chocolate and Peanut Butter. I pull off the lid and this gelato smells perfect. Oh I do love the smell of peanut butter in chocolate. It's just one of those wonderful smells that I can't get enough of. I know, I'm an addict. I took a few bites to reveal the shot above. Wow, we are talking big chunks of peanut butter swirl. The base gelato is also immensely soft. It's funny because you scoop easy through the gelato, and then hit a big chunk of swirl and so you wind up with giant spoonful of treat. If you look real closely, you may notice that some of the swirls have been broken up into little pieces (which ofcourse makes for a very fun scoop). The swirl isn't real salty or gritty, it's a nice middle of the road flavor that shouldn't offend. 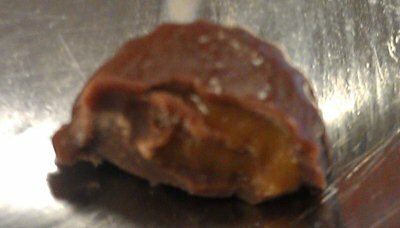 Not the best shot, but check out the cute little peanut butter cups. There doesn't seem to be a ton of them, but they are around. To my surprise, there's actually a soft gooey filling inside. Do I have you drooling yet? Is the kid in you just dying to run out to the store and pick up seven pints of this stuff? Well... hold your horses there my friend. We've got a possible problem. There is something weird going on here, it's like an unnatural smoothness or something. Now there is coconut oil in here for some reason, but I'm not positive that is what is causing the issue since I don't taste coconut (I don't think anyway). At first I was thinking maybe they mix peanuts and coconut oil. The weirdness is so hard to describe. It's definitely in the base. You know how I complained that the sea salt caramel flavor is almost too dry? Well, this one is almost too wet. I started wondering if maybe they put peanut oil in the base gelato to spice things up and then somehow that messes with the texture. Well, I've gotten 1/3 down into this pint even though something ain't right, plus I still want to keep going. I keep waiting for the weirdness to go away. Ok, I'm full enough for now, I'm thinking this will be better on the second scoop. Sometimes things are just so different that you can't settle in at first. Stay tuned for the second scoop tomorrow. On Second Scoop: I'm back, and as expected, the second scoop went better. I had a bit of an epiphany this morning. I don't remember where or when, but I think I've had some all natural or fresh pressed peanut butter at some point and that's how this gelato tastes. I think they infuse the gelato with peanut oil and that's how they make it so soft and flavorful, and I mean really soft. Fresh out of the freezer and this one scoops like a cold 3 Musketeers bar. You take that factor and combine it with a peanut butter swirl that is probably the most plentiful peanut butter swirl I have ever seen. This one is different, but oh it's done amazingly well. So much peanut butter, so soft, so tempting to eat the whole thing. The Final Scoop: I never did figure out what the underlying taste is, but that didn't stop me from polishing off this well made treat. Make sure to check back and let us know what you think of it. Hmmm...tepid review aside, I've got to start looking for this stuff. It SOUNDS like it could be awesome, but names are often very deceiving. I'm anxiously awaiting your second scoop verdict! I'm pumped to finally take a trip to that health store to get my hands on the chocolate banana flavor. According to convo I had with them over facebook they have a few other flavors up their sleeve for release in the near future. Well, I was a huge fan of the sea salt caramel and it fulfilled many of my gelato dreams, so I will DEFINITELY be partaking in some of this peanut butter goodness. Oh my god that looks good. I have a soft spot for peanut butter and chocolate too. I am going to have to look around for this flavor. This flavor needs to be stocked on shelves every where because I need to try it! Chocolate and Peanut Butter is the best combination!